Congratulations on your pregnancy! Many women desire a natural birth but preparing for one can seem overwhelming. 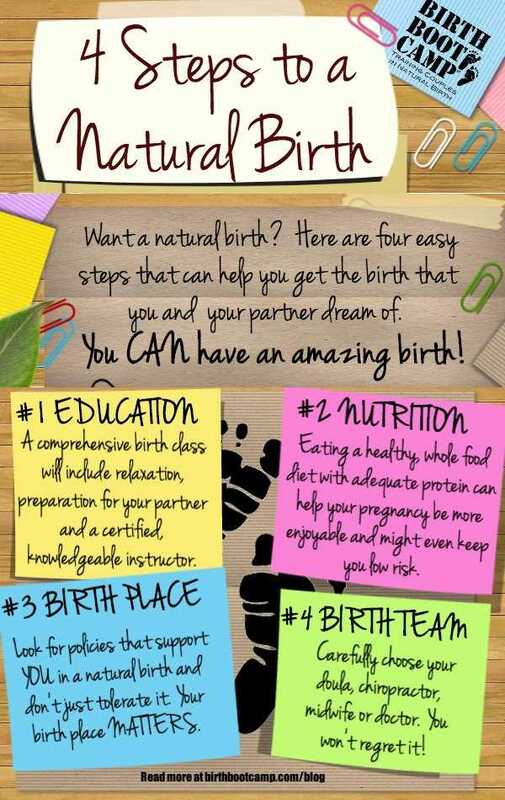 Here are some wonderful tips for preparing yourself for the best natural birth possible. There is so much you can do to ready yourself and your family for birth. With these four simple things: education, nutrition, birth place, and birth team, you will be more able to make your goal a reality. #1-Education- Probably the most important step in preparing for natural birth is to educate yourself as much as possible. Just as with breastfeeding, the more you know about the benefits of natural birth for you and your baby, the more motivated you will be to follow through and prepare accordingly. Of course there is a plethora of information out there on birth. How do you trudge through it and find the diamonds among the coal? First, a comprehensive childbirth education program is a must. Look for one that is longer rather than shorter. A weekend â€œcrash courseâ€ cannot possibly give you all the information that you need to navigate policies, stay low risk and prepare properly for the birth you want. Look for natural childbirth classes that cover staying low risk, nutrition and exercise, relaxation techniques, choosing a care provider and birth place, the stages of labor, preparing your partner, common policies and procedures, breastfeeding and newborn care, and possible complications and how to avoid them. Not only will a good birth class help prepare you, it should prepare your partner as well. In all honesty, your partner’s preparation is tantamount. If they are frightened or simply unaware of normality, it will inevitably impact the birth negatively. #2-Nutrition- As you will quickly learn, preparing your body for a natural birth is just as important as preparing your mind. Your body will go through some drastic changes as it grows first a placenta, then a baby, adds fluid, almost doubles its blood volume and prepares for future breastfeeding. Eating properly means not just avoiding refined foods such as sugars, white flours, packaged foods and chemical sweeteners, it also means adding the right foods into your diet. Daily nutrition should include several servings of greens (broccoli, spinach, kale, asparagus, etc), citrus foods (oranges, tomatoes, kiwis, bell peppers), vegetables and fruits (celery, cucumbers, bananas and apples), whole grains (spelt, quinoa, oatmeal), eggs, complete protein sources (meats or other combined proteins such as beans and rice) and dairy (milk, Greek yogurt, keifer). Women are amazed at how much better they feel when eating properly during pregnancy. Many common pregnancy ailments disappear. Great nutrition and adequate protein can even help eliminate morning sickness. Your childbirth instructor can provide you with a complete system to chart your nutritional intake and make corrections, if needed. You can also find many phone apps with which you can keep track of your daily nutrition throughout pregnancy. Great nutrition will help your body and your baby be ready for a natural birth. Many care providers believe that common ailments that surface at the end of pregnancy and often lead to induction or C-section can actually be avoided with optimal nutrition. #3-Choose Your Birth Place Carefully- One of the most important choices, as you prepare for a natural birth, is your choice of birth place. Many factors play into this decision from insurance coverage to proximity. Women often have three main choices available to them when it comes to birth place: hospital, birth center or home. The birth place that works best for you and your family will be influenced by many things, from cost to your own health to where you feel most emotionally comfortable. Women are encouraged to eat and drink in early labor. Vaginal exams are kept to a minimum. Women are encouraged to move about in labor. IV’s are only given when necessary. They have a low C-section rate. In a birth center, you may want a hospital nearby in case of transfer and an environment in which you feel comfortable and supported. If choosing a home birth (as with any other birth place), you will want to carefully choose your midwife. Look specifically for someone with experience, skills or certification that you feel comfortable with. While it may be tempting to choose a birth place simply because it is close, doing things because they seem easy is an often regretted decision for birthing women. A nearby hospital with a sky high induction and C-section rate will greatly increase your chances for the same. In the case of an unwanted and/or unneeded cesarean section, a shorter drive for a birth place can yield a much longer recovery. Choose your birth place carefully. #4-Choose Your Team Well- You won’t win the Super Bowl with a football team made up of expert karaoke singers and you won’t get a natural birth with a team of care providers who specialize in surgical birth. Choosing your birth team carefully is one of the best ways to ensure you get a natural birth. Sometimes, even when a mother is knowledgeable and physically prepared, things can fall apart for her in labor if her team doesn’t support her decisions. So how do you find this pro-natural birth team of supporters? Asking your childbirth instructor is a great way to start. As a woman experienced in birth and engaged in the local birth community, she should have a list of resources to provide you with. There are many people who will make up your birth team. All of these people will influence your birth experience. A great doula (a woman trained to support a birthing mother) can be a fabulous resource for both the laboring woman and her partner. She can provide emotional and physical support, an experts view on supportive care providers, and may act as a sounding board for advice. Another good person to have on your team is a Webster Certified chiropractor. Chiropractic care during pregnancy (and even birth) can help ensure the pelvis is well aligned so that it can move for a faster and more comfortable birthing experience with a better positioned baby. This alone can help avoid many problems that prevent natural birth. Probably most important of all is your choice of care provider. Your doctor or midwife will make decisions when you can’t and will be there for the final moments of birth. It is vitally important that this person be both trustworthy and skilled. If you are a low risk woman, you may want to consider midwifery care. Midwives often work in hospitals (thought many can be found working in a home birth or birth center environment) and their approach to birth tends to be more supportive of natural choices. You CAN Have an Amazing Birth! Choosing a natural birth is a wonderful decision. With the right choices and preparation, we believe that most women can achieve this goal. Proper education, excellent nutrition, and careful choice of your birth team and your birth place are all things that can make your choice of a natural birth more attainable. When all is said and done, sometimes things don’t go exactly as planned. But, when we have done our best and chosen a care provider that we trust, we can rest assured that we did everything possible to accomplish our goal.